Having the best download tool is always a dream for every user out there in need for the best user experience. With the increasing number of download applications, it is highly likely that finding the perfect tool would surely be time-consuming. However, this article has made it super-easy by giving you a guide on the most reliable, simple, and fastest Radio Javan downloader. Radio Javan is a Washington, DC, United States based internet radio station which offers news, information as well as entertainment news in Iranian and Persian languages. This radio station is known to be the first internet radio to provide the Iranian language programming. Since its launch, the radio station has been the largest contributor Persian entertainment by offering the top awesome Persian and Iranian music online. Radio Javan program allows users to get up-to-date music through the live radio feed and download them if you like in quality format like 1080p HD. By downloading your favorite music and videos, you would be able to watch or listen to them when offline without having to worry about bundles or Wi-Fi connection. You can create and store the music of your choice via the personal play list function. For those interested in listening to live music, the streaming function referred to as Persian Music would be quite essential. The free and stylish program is ideal for adults and teens who enjoy listening to the most up-to-date Iranian and Persian music and entertainment without a single penny. iMusic is one of its kind best Radio Javan downloader app for users around the globe. The resourceful application is an all-in-one platform which users can solve virtually all their media related problems without the need for a secondary application. This is so because the tool has been equipped with variety of functional and crucial features meant to reduce the possible hurdles and enhance the user experience as much as possible. 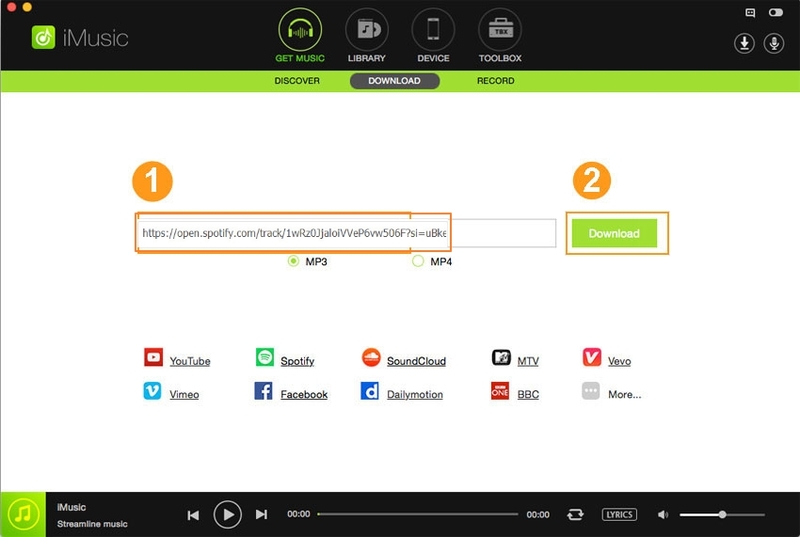 The tool is not only a downloader but also a converter, recorder tool and hence users can convert or record their favorite music or radio programs much easier than they thought. There are millions of users across the globe who have been and continue to keep unending faith with this perfect tinker tool. Don’t spent much time out there curating through daunting lists of Javan Radio downloaders. Just choose iMusic downloader and you shall find all that you ever needed from an ideal downloader. Free of bias, iMusic is unmatchable and should definitely top your priority list. iMusic features an in-built music library which makes it absolutely easy for users to stream and download their favorite music and programs. In case you lost your iTunes Library or you recently acquired a new computer, this program will let you restore or transfer your iTunes Library to the new PC without difficulties. Transfer files between different devices including the hot ones like iPhone, iPad, iPod, Samsung Galaxy, and Huawei via a suitable media for users to share them on social media platforms. Access and download your favorite music from several online platforms like YouTube, Vimeo, and Twitter among others. In fact the program supports more than 3000 different video sharing websites. 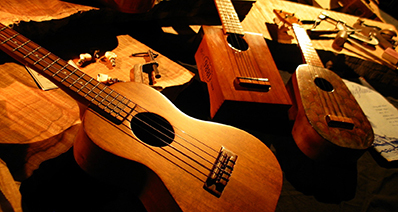 Record music, radio programs, and ringtones among others from various online sources for offline use. Powerful toolbox which essentially avails more solutions like recovery of iTunes Library, backup iTunes, as well as removal of DRM protection on your device among others. On your computer, launch the iMusic application to open the primary interface and then navigate to open the “GET MUSIC” window. Go to the “LIBRARY” menu, then the recording icon situated on the left side to locate the Javan Radio file you just recorded. You can then choose to transfer this file to your device via a suitable media say a USB for sharing with friends. Launch the iMusic program and open the “GET MUSIC” window at the top of the primary interface. Navigate to the site you would like to fetch your video from. 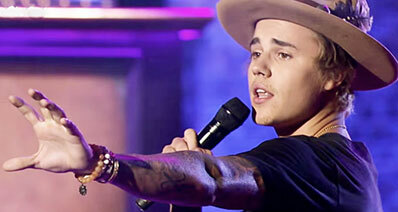 Query the respective video, copy its URL code and go back to iMusic downloader. Within the “GET MUSIC” window, identify and click the “Paste URL” button. The URL code you just copied from the video site would be pasted on the program. Choose the desired file format and hit the “Download” button start the download process. 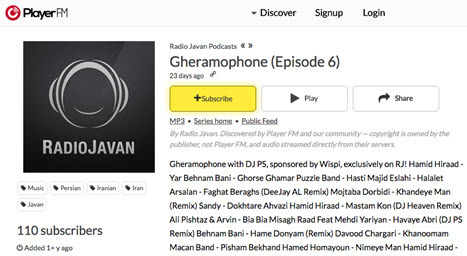 Gheramophone is another popular Radio Javan hot program with DJ PS. The program is sponsored by Wispi and available exclusively on RJ! The program stares the likes of Hamid Hiraad, YarBehnam Bani, Ghorse GhamarPuzzle Band, HastiMajid Eslahi, HalaletArsalan, Faghat Beraghs, Khandeye Man, Dokhtare AhvaziHamid Hiraad , Ali Pishtaz & Arvin among others. RJ Countdown is a popular Radio Javan program with the latest played on March 3, 2018. The program is available on Radio Javan for listening and download. The program stares the likes of Hamid Hiraad, YarHoorosh Band, Leili Bi EshghSahar, KhastamErfan, Mano Natarsoon, HastiFarzad Farzin,Lanati Arash , Dooset Daram (Ft Helena)Amirhossein Eftekhari, and Halalet. TranceForm with Sasver is another amazing and interesting Javan Radio program worth listening and downloading. The program is exclusive on RJ and features Sasver Taste Of Love Remix by Saman Mehmani , First State Feat Sarah Howells , Brave remix by Andy Moor, and let It Be Forever remix by Armin van Buuren just to mention but a few. Majoon should be a good Radio Javan program to listen and download. The with program by DJ Emzee is available on Radio Javan and features Donyaye In Roozaye Man,vash Ghomayshi, ParandehMohammad Alizadeh, Eshgham InroozaEhsan Khajehamiri, and NafasPascal Junior among others. Just listen and download this program to enjoy the best of Persian and Iranian music. 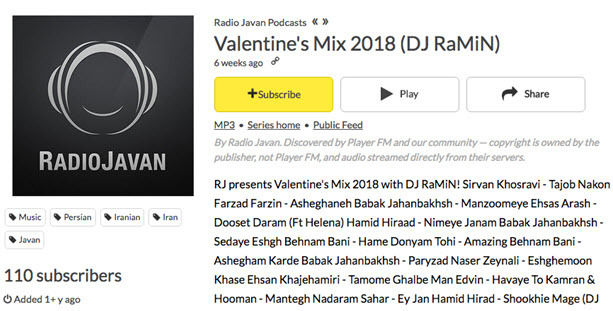 Dance Station with Hosein Aerial is exclusive on Radio Javan featuring Sina Shabankhani, Khaterate Khosh , Arash Feat Helena , Dooset Daram, DJ Mehmet Tekin as well as World Of DreamsBehzad . With this program, you would be sure to enjoy listening to Radio Javan. Dubways is a good Radio Javan program with AFX and exclusive on RJ! It features Cureton, Confused, StoryDJ, Closer by Robert Cristian, and Tell Me Why among others. RhythmOtism is another excellent Radio Javan program with DJ Cincinati starring Sina Shabankhani, AmdanMasih, To Ke Nisti PishamMasoud Saberi ,Tame JonoonAlireza Talischi - Ay Dele KhodamShahab Mozaffari, Nimeye JanamPuzzle Band , and Delaaram just to mention but a few. Valentine Mix is yet another amazing hit featuring the 2018 Valentine’s mix. The hot mix is done by the likes of DJ RaMiN, Sirvan Khosravi, Tajob NakonFarzad Farzin , AsheghanehBabak Jahanbakhsh , and Manzoomeye EhsasArash among others. 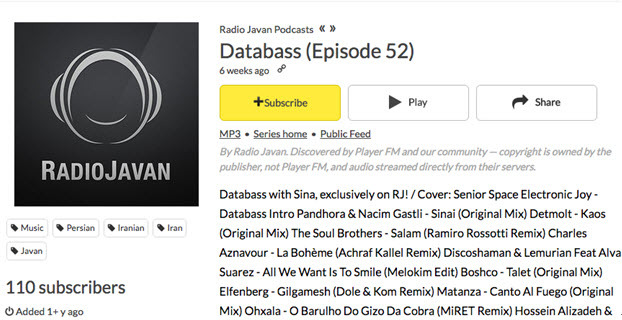 Databass Episode 52 is another super Radio Javan program with lots of viewers. The program is presented by Sina and exclusively available on Radio Javan featuring Space Electronic Joy, Databass IntroPandhora & Nacim Gastli, Sinai, and The Soul among others. Mar Mari is another popular Radio Javan program with DJ Amin starring IntroSirvan Khosravi, BargardAmir Yeganeh , Bazam ShekastShadmehr Aghili , and MaroofMehran Abbasi just to mention but a few. Apple Music Radio Not Working on Mac or iPhone? Solved!